During a fire, the ceiling cavity can allow fire or smoke to spread throughout a building. To inhibit fire entering the cavity via the ceiling loudspeaker, it can be fitted with an LBC 3080/x1 steel fire dome. This is mounted on the loudspeaker assembly using four selftapping screws supplied with the fire dome. The firedome has knockout holes for two grommets (supplied) and two cable glands (PG 13). 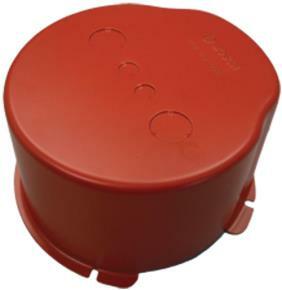 The LBC 3080/x1 Fire dome is available in two color versions: the LBC 3080/01 is flame red (RAL 3000) and the LBC 3080/11 is white (RAL 9010). This fire dome can only be used with the ceiling speakers: LBC 3087/41, LBC 3090/01, LBC 3090/31, LHM 0606/00, LHM 0606/10, and LHM 0626/00. สี LBC 3080/01 สีแดงสดใส (RAL 3000) LBC 3080/11 สีขาว (RAL 9010).